In the same family as the sunflower the Gerber is an annual plant that attracts butterflies and birds but is resistant to deer. 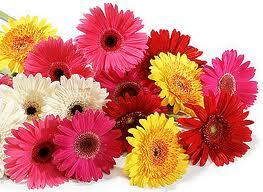 As a cut flower it comes in a variety of colors including white, yellow, orange, red, coral, pink, and a burgundy shade. Also commonly known as the African Daisy it is available in both the mini and large sizes and is the most used cut flower in the world after the rose, carnation, chrysanthemum and tulip. Next post: December Flower Specials!! !